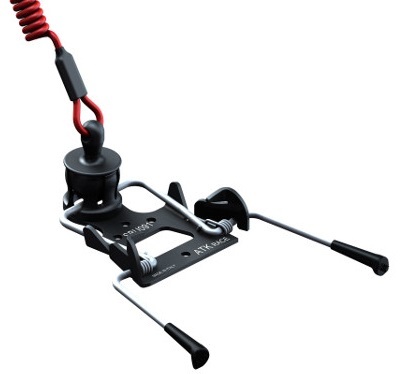 An interesting ski brake that sits in front of your toe piece, ready to spring into action. You attach a leash to your ski boot and when your ski is pulled away with enough force, the brake arms deploy. This mechanism is triggered by pulling a retaining-ball out of a socket. The socket mechanism is mounted to your skis with two screws. Sold in pairs of two brakes, weighing just 65 grams each. How wide/narrow a ski will this brake work with? Hi Alex, the sets we have in stock at the moment are relatively skinny: 75mm wide.